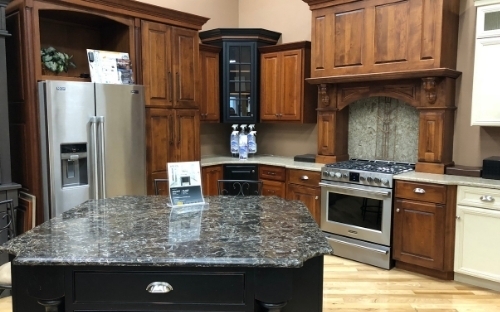 Let our friendly staff show you the latest in kitchen and bath cabinetry styles and high-quality finishes from top cabinet manufacturers such as Omega, Homecrest and River Run when you visit our Kitchen Showroom and Design Center. Choose traditional or contemporary styling in maple, oak, hickory, cherry, white and silk and for an accent, add a glaze finish. You'll find a variety of products that offer the elegance, durability and affordability you want to make your kitchen or bath, office or game room a real showplace. At Iverson's Lumber Company we are committed to offering the highest quality kitchen and bath decorative hardware for our customers. Choose your style of the finest hardware for your cabinets from Omega, Century, Emtek, Homecrest, Top Knobs, Jeffrey Alexander, and Century Hardware. After you have selected your cabinets, turn your attention to countertops. We are a specialized dealer for Cambria, LG Viatera and Zodiaq Quartz surfaces. Acrylic solid surfaces such as DuPont Corian, LG Hi-Macs, Livingstone and Wilsonart solid surfaces. We also offer other options as granite, Formica and Wilsonart laminate, custom countertops and butcher blocks. Stop in, call or email us today and let our staff help you design the kitchen or bath of your dreams. We offer Free Cabinet Consultation and Estimates. Don't wait another day, let us help you make your dream kitchen or bath a reality! Products from names you can trust!